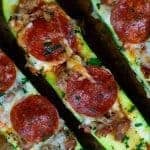 This pizza stuffed zucchini skips the crust and leaves you with all of the tasty pizza toppings stuffed inside a hollowed out zucchini. Preheat oven to 375 degrees. Spray a large baking sheet with non-stick spray. Brown the sausage in a medium skillet over medium heat, crumbling as it cooks. Drain the grease and place sausage in a small mixing bowl. Add the marinara and 1 ½ cups of mozzarella to the bowl. Stir to combine. Slice the zucchini in half length-wise and use a spoon to scrape out the seeds. Fill the hollowed space in the zucchini with the meat mixture. Sprinkle the remaining mozzarella and the Parmesan on the zucchini. Place 2 pepperoni on each zucchini. Bake for 30 minutes or until the zucchini is as tender as you’d prefer. Sprinkle with parsley and red pepper flakes, if desired, before serving.